Team VCE (minus photographer Nicasio Vina Davila) in the Cuchilla de Toa mountain range, 4 April 2017. After weeks of restless, uncertain waiting, our visas suspended in bureaucratic limbo, John Lloyd and I touched Cuban soil on 27 March, at the small airport of Holguin. Our host and visa savior Nicasio Viña Davila greeted us warmly, piled our gear into the double-cabin pick-up truck in which we’d rack up many hundreds of miles in the days ahead, and we motored off to Santiago de Cuba. First impressions, even in the city (Cuba’s second largest, with ~500,000 residents): no traffic jams, no honking horns or loud voices, no litter. The atmosphere is tranquilo, unhurried. We spent day 1 meeting key staff at our sister institute, Centro Oriental de Ecosistemas y Biodiversidad (BIOECO). Their eagerness to collaborate was sincere and inspiring, and their English slightly better than our Spanish. With Nicasio translating for both sides as necessary, we presented (in passable Spanish) a Powerpoint about VCE’s quarter-century of Bicknell’s Thrush (BITH) work and our plans for an islandwide survey of Cuba. Our BIOECO colleagues reciprocated with an overview of their diverse research programs, and their hopes to form a collaborative partnership with VCE. We ended the session by proposing to draft a formal MOU between our two institutes. We then toured BIOECO’s field station in the dry forests of Siboney, 15 km to the west. That site visit not only produced endemic Cuban Gnatcatchers and Oriente Warblers, but a firsthand introduction to the station’s ecological research, which is impressively ambitious and rigorous. Two endemic specialties of Siboney’s dry forests: Cuban Gnatcatcher (left) and Oriente Warbler (right). Photos courtesy of Nicasio Vina Davila. Right: dense cloud forest at km 10 on the 13-km trail to Pico Turquino; left: Pico Turquino at 1,974 m elevation. Despite recent records of overwintering Bicknell’s Thrush on Turquino and plenty of seemingly suitable habitat, VCE found no birds present in late March, 2017. Our next move was east, to Parque Nacional Pico Bayemesa, still within Sierra Maestra, but at lower elevations. We spent one night camping in a long-abandoned tiny village near Pico Botella, very close to Che Guevara’s infamous mountain hideout. Our dusk surveys turned up the usual cast of characters: singing Cuban Todies, Cuban Trogons, Cuban Solitaires (my personal favorite), and the ubiquitous Red-legged Thrush, but no BITH. The next morning yielded a surprise, with responses from two BITH just below the summit at 1,462 m (4,456 ft) elevation, in dense, low vegetation with scattered emergent hardwoods and pines—not classic cloud forest, but with the BITH-like prerequisite of being virtually impenetrable. So, we could claim some success after all, but these encounters only heightened our questioning and sense of intrigue. This second leg of our expedition led us to the island’s easternmost reaches, for surveys in the wet, lower-lying mountains of the Sagua-Baracoa massif. Leaving Santiago de Cuba by 6 am on 4 April, we passed through Guantanamo, then traversed through the Cuchilla de Toa range en route to Cuba’s oldest city of Baracoa, with its quiet, charming cobblestone streets. This region of the island was slammed by Hurricane Matthew in early October 2016, causing severe damage to both human infrastucture and natural habitats. The habitat we passed through didn’t jump out as having high BITH potential, but some of the higher elevations will bear future checking. The following morning had us moving by 5 am (our landlord having graciously supplied a thermos of hot coffee at 0445! ), en route to Humboldt National Park. We surveyed a 3-km transect through wet, serpentine broadleaf “rain forests” from ~300—625 m elevation on the Balcon de Iberia. Humidity felt close to 100% and sweat poured as we hustled upslope to take advantage of the cooler early morning, when BITH are most responsive. The bizarre, gurgling calls of Cuban Crows gave way to trogons, todies and solitaires. A few patches of dense undergrowth with climbing bamboo and many downed trees or branches seemed promising, but no BITH materialized. Tres amigos in Cuba: from left, Chris Rimmer in hurricane-damaged forest on Balco de Iberia, Nicasio Vina Davila photographing Bee Hummingbirds in the foothills of Parque Nacional Humboldt, John Lloyd just below the summit of Pico Turquino. Our final BITH sortie found us lurching in the truck that afternoon over 28 km of very rough roads towards the tiny, remote town of La Melba, located near a now-closed bauxite mine. 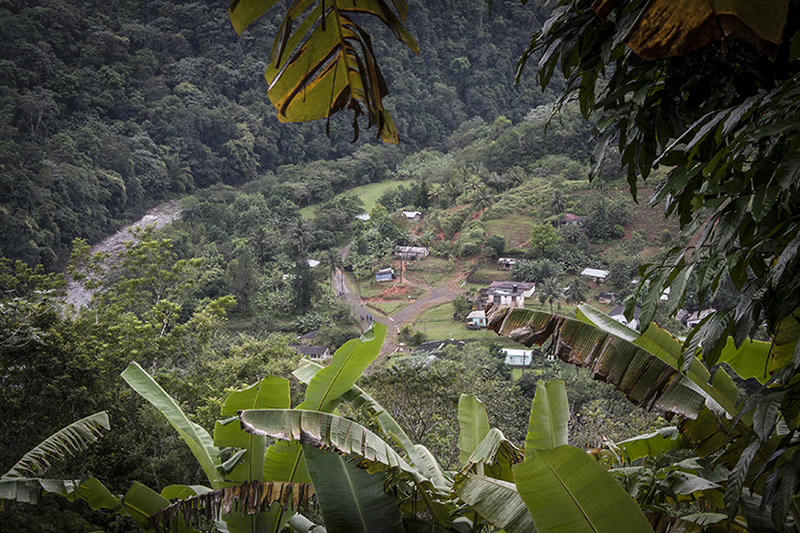 There can’t be many communities in the western hemisphere that are as physically isolated as this one, though it boasts its own school, two doctors and a panaderia (bakery)! Our hopes of dusk BITH surveys were thwarted by impassable road conditions, so we consoled ourselves with a refreshing dip in Rio Melba, then camped outside the park headquarters. A steady stream of locals stopped by, and all seemed to know Nicasio. The tiny, isolated outpost of La Melba, a former bauxite mining town inside Humboldt National Park, population ~200 and dwindling. Team VCE spent a night here, highlighted by a delightful dusk swim in Rio Melba. Our final field day featured dawn surveys along the road back to the lowlands, where we again “dipped” on BITH, not surprisingly. Having promised us a Bee Hummingbird, Nicasio detoured to a boy scout camp, Campamento Pioneros Cayo Guam”, now empty during its off-season. The world’s smallest bird did not disappoint, as we were treated to a spectacular lek display of 3 males performing aerial histrionics for a mostly invisible (to us) female. We heard our final trogon and solitaires singing here, then began the long trek back to Santiago de Cuba, stopping for lunch in the town of Moa to celebrate Yasit’s birthday, complete with a pink-frosted cake. Two Cuban endemics among the 13 species we encountered: Bee Hummingbird, reputedly the word’s smallest bird, and Cuban Trogon, the national bird of Cuba. Photos courtesy of Nicasio Vina Davila. Despite finding only 2 BITH, VCE’s inaugural trip to Cuba was an unqualified, resounding success. We accomplished our primary goals of forging a strong partnership with BIOECO, experiencing the logistics of field work, becoming familiar with the landscape, and refining our thoughts about how to tackle this challenging bird across the island. Cuba is a captivating country, rich in biodiversity, with relatively well-conserved natural habitats, and a strong scientific infrastructure. John and I are truly enthused about the opportunities for VCE to work there, and there is little doubt that we’ll be back. A sign of the future in Cuba: John Lloyd and Chris Rimmer flank Jose Ramon Fuentes as he proudly displays his VCE staff t-shirt. Photo courtesy of Nicasio Vina Davila. Thank you for the interesting report. I am sure there is much more you could have written. For example, about the wonderful kestrels and any thoughts on ivory bills! Humboldt must have been a special treat among the locales. Adventure in the name of science. This is fantastic.